★ Widely support coat, necklace, bracelet, scarf, umbrella, bag, towel, key, hat, cup as well as Christmas socks and christmas wreath. ★ Made of zinc alloy with a maximum weight of 35 lbs. Screws length: 0.63". - Product Warranty and Customer Service - We do not sell perfect pictures but goods, we provide full refund or reshipping new goods for free if you are not satisfied with our products. - Multiple Applications - These retro hooks design with double hooks, perfect for use in bathroom, bedroom, closet, foyer, entryway, fence hanging towels, coat, hats, purse, jackets, robe, back packs. DIY pellet coat rack, and make them easy to find. These double hooks is a good way to store your space. - High Quality Material - These heavy duty dual prong hooks are made of good quality zinc die-cast material, the screws are made of iron, it can easily hold up to 35 lbs of weight. Hard and durable, can widely support coat, scarf, umbrella, bag, towel, key, hat, cup as well as Christmas socks and christmas wreath. 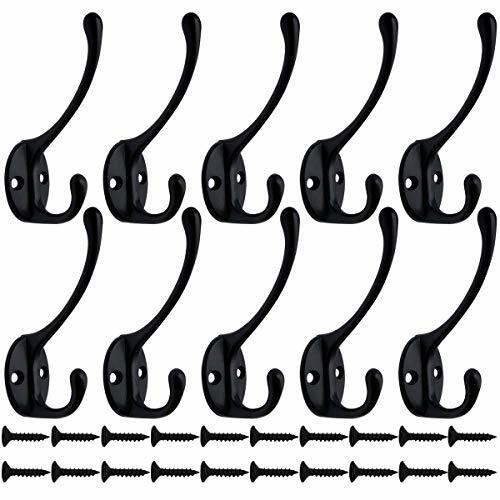 - Size - the clothes hook dimension is 91 x 53 mm/ 3.6 x 2.1 inches, screws are 16mm long and 6mm in screw head diameter, easy for installation.